This nice postcard is from the late 1940s. United used that logo from 1940 to 1954. “Mainliners” were DC-3s. With world-wide production, some 16,000 of these planes entered service somewhere…and some are probably still flying. 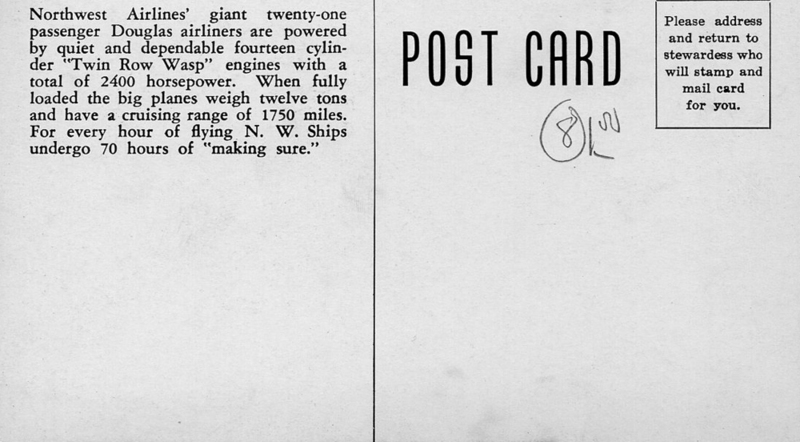 Posted in Existing photo processed by Bob Lawrence, Uncle Bob's Pix and tagged DC-3, Mainliner, post card, United Air Lines. Bookmark the permalink. 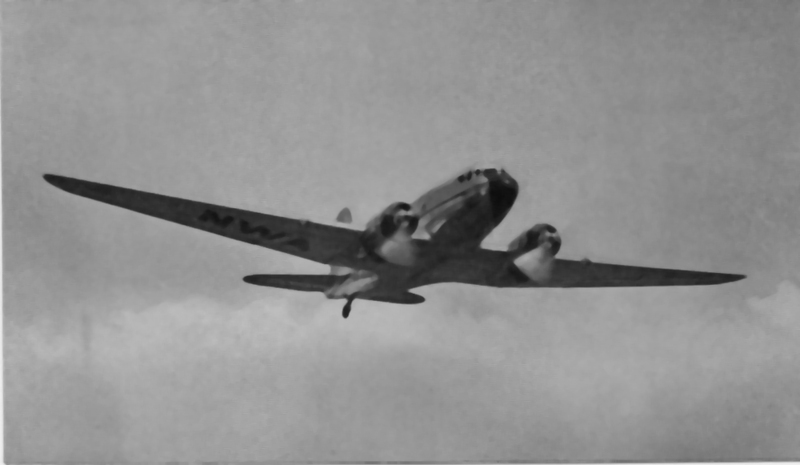 A Mackey Airlines DC-3 heading south. The card is probably from the late 60s. Posted in Uncle Bob's Pix and tagged DC-3, Eastern Airlines, Fort Lauderdale FL, Nassau, Tampa. Bookmark the permalink. These are two cards that were probably in a folder given to each passenger as they boarded the plane. You added your message to and address of your BFF back home, give it to the stewardess. She would then affix a stamp and mail it for you. NWA was around from the late 20s, then was absorbed, eventually, by Delta. 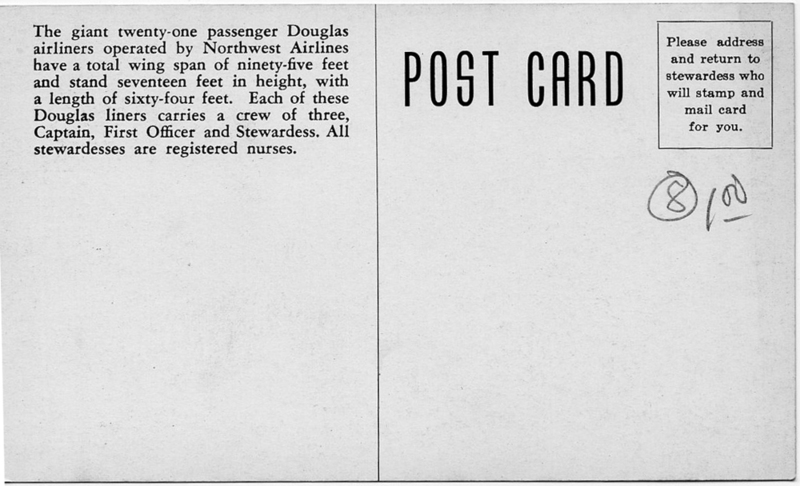 Posted in Existing photo processed by Bob Lawrence and tagged C-47, DC-3, Delta Airlines, Douglas Commercial aircraft, Northwest Airlines, Northwest Orient. Bookmark the permalink. This is one of those post cards that I know something about, but only can suggest other things. First, it is an American Airlines DC-2, Flagship Line. It’s at Tri-Cities airport (then McKellar Field). 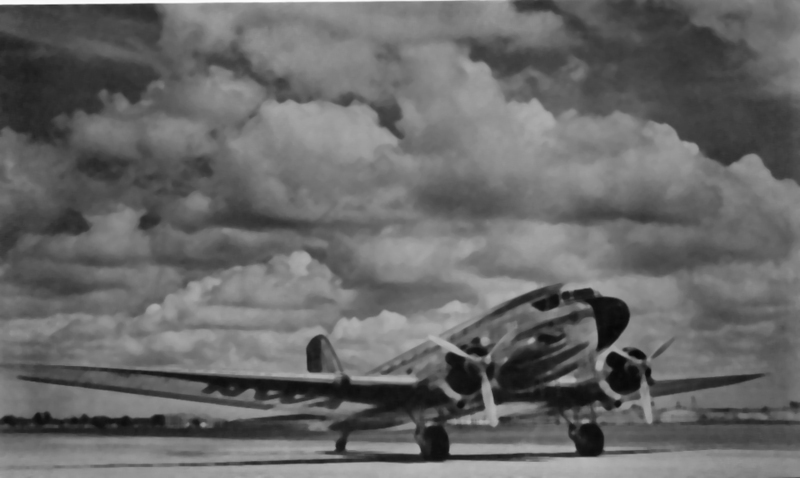 The first DC-2 flew into the airport in September, 1937. Judging by the way the photo was taken, I think the photographer was more interested in the news aspect of the occasion than with any person on the flight. I think the original photo (there’s no attribution) was taken to record that inaugural event. Piece of history, that. Two months later, the airport was officially recognized as McKellar Field. I know it was published by Lisanby’s Gifts in Bristol VA. It apparently is D-6 of a series. I do not think the card dates to the time the picture was taken. I can find no reference on the web to “Lisanby’s Gifts” in Bristol. There were a number of these for a buck or so each at Abingdon Antique Mall, as of 3/12/16. If anyone knows anything about this card, I’d appreciate a comment on it. 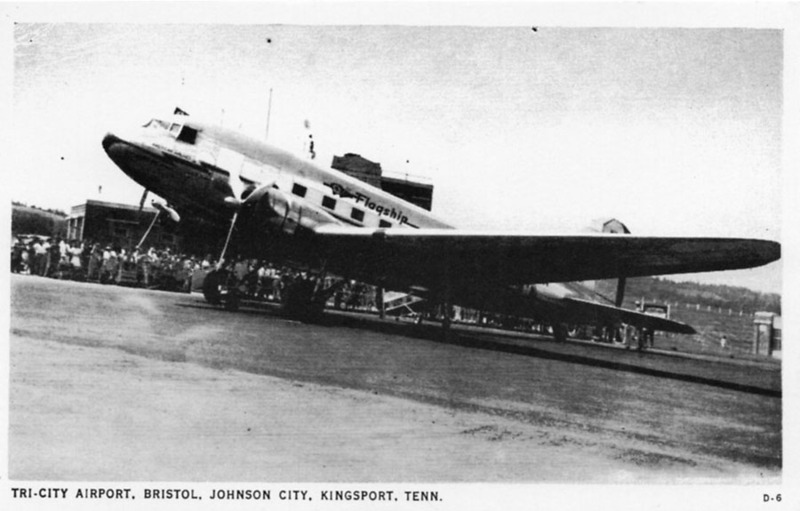 Posted in Existing photo processed by Bob Lawrence and tagged Abingdon Antique Mall, American Airlined Flagship Line, American Airlines Flagship line, DC-3, Lisanby's Gifts Bristol VA, McKellar Field, Tri-Cities Airport. Bookmark the permalink. Easily one of my favorite airline cards. 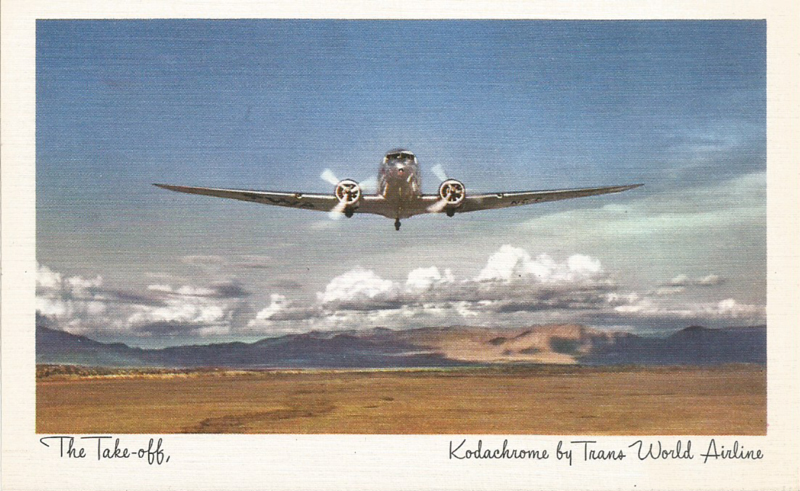 This great 1947 shot, unattributed except for the “Kodachrome by Trans World Airline” cut line, is of a DC-3. This same shot, on an earlier card, is noted as a “Color Foto by Trans World Airline”. Posted in Existing photo processed by Bob Lawrence and tagged DC-3, Kodachrome, TWA. Bookmark the permalink.